According to the Bible, at the beginning of time all of humanity was unified in a state of harmony. Interestingly, the Bible clearly emphasizes that the key to this harmony was linguistic: “Now the whole world had one language and a common speech” (Gen. 11:1). I will also assert that such was possible because of a Good God who had made it so. It's the way it was intended to be. 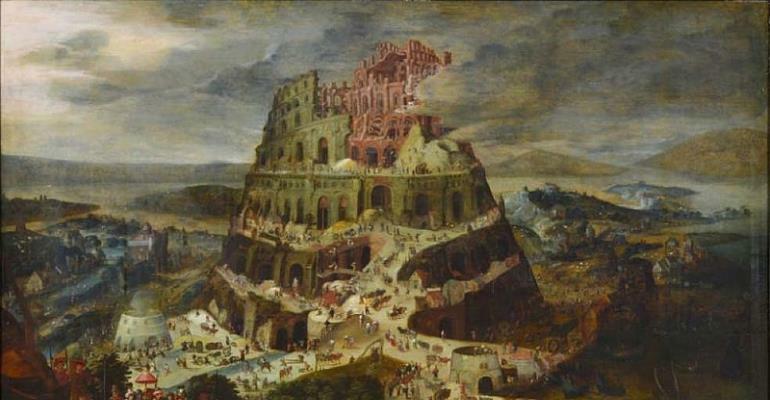 Unfortunately, due to the sin of the Tower of Babel, a state of linguistic confusion scattered humanity across the globe. I call a further step of mankind to fall even further away from God our Creator.This as a result people wanting to use a good purpose to achieve the wrong aim. Today, thousands of languages are spoken throughout the world. Language plays a huge role in defining who we are. The ability to speak the same language creates an immediate bridge between strangers. Conversely, language barriers prevent warring civilizations from adequately understanding each other. Wouldn’t it be nice if all of humanity spoke a single language? Today God uses His Spiritual Word through His Spirit with His children whom He has called and know God truthfully and spiritually. Yes today God who is a Spirit ( John 4: 23-24 ) now relates to His children in their spirits through Jesus Christ. John 10: 27-28; My sheep hear or listen my voice I know them, and they follow Me. John 8: 47, whoever belongs to God hears His voice through His Word. Is it not also true that many don't hear Him yet claims falsely that they are speaking for God. We can only happen to have a true Spirit FILLED relationship with God through our own spirits. Question: "What does it mean to worship the Lord in spirit and truth?" The idea of worshipping the Lord “in spirit and truth” comes from, one interpretation Jesus’ conversation with the woman at the well in John 4:6-30. In the conversation, the woman was discussing places of worship with Jesus, saying that the Jews worshipped at Jerusalem, while the Samaritans worshipped at Mount Gerizim. Jesus had just revealed that He knew about her many husbands, as well as the fact that the current man she lived with was not her husband. This made her uncomfortable, so she attempted to divert His attention from her personal life to matters of religion. Jesus refused to be distracted from His lesson on true worship and got to the heart of the matter: “But the hour is coming, and now is, when the true worshipers shall worship the Father in spirit and truth, for the Father seeks such to worship Him” (John 4:23). The second interpretation which many have been deceived is using our spirits as an instrument to relate to God. I will at some point come to that in due course God willing. Now continuing the overall lesson about worshipping the Lord in spirit and truth is that worship of God is not to be confined to a single geographical location or necessarily regulated by the temporary provisions of Old Testament law. With the coming of Christ, the separation between Jew and Gentile was no longer relevant, nor was the centrality of the temple in worship. With the coming of Christ, all of God’s children gained equal access to God through Him. Worship became a matter of the heart, not external actions, and directed by truth rather than ceremony. Living out the God controlled life and relationship. In Deuteronomy 6:4, Moses sets down for the Israelites how they are to love their God: “You shall love the Lord your God with all your heart and with all your soul and with all your might.” Our worship of God is directed by our love for Him; as we love, so we worship. Because the idea of “might” in Hebrew indicates totality, Jesus expanded this expression to “mind” and “strength” (Mark 12:30; Luke 10:27). To worship God in spirit and truth necessarily involves loving Him with heart, soul, mind, strength, and our all. True worship must be “in spirit,” that is, engaging the whole heart. Unless there’s a real passion for God, there is no worship in spirit. At the same time, worship must be “in truth,” that is, properly informed. Unless we have knowledge of the God we worship, there is no worship in truth. Both are necessary for satisfying and God-honoring worship. Spirit without truth leads to a shallow, overly emotional experience that could be compared to a high. As soon as the emotion is over, when the fervor cools, so does the worship. Truth without spirit can result in a dry, passionless encounter that can easily lead to a form of joyless legalism. The best combination of both aspects of worship results in a joyous appreciation of God informed by Scripture. The more we know about God, the more we appreciate Him. The more we appreciate, the deeper our worship. The deeper our worship, the more God is glorified. This melding of spirit and truth in worship is best summed up by Jonathan Edwards, the 18th-century American pastor and theologian. He said, “I should think myself in the way of my duty to raise the affections [emotions] of my hearers as high as possibly I can, provided that they are affected with nothing but truth.” Edwards recognized that truth and only truth can properly influence the emotions in a way that brings honour to God. Not just of mental exercises or of knowledge only. The truth of God, being of infinite value, is worthy of infinite passion.